Following on from their line of successful film making tutorials for Directors, Per Holmes and the Hollywood Camera Work team have launched their new app for iOS/Android and Mac/Windows – Shot Designer. This is a ‘blocking’ tool – a visual way of mapping out ‘who or what goes where, does what and when’ in a scene, and where cameras should be to pick up the action. For a full intro to the craft of blocking scenes from interviews to action scenes, check out the DVDs, but whilst they can be – and often are – scribbled out on scraps of paper, Shot Designer makes things neat, quick, sharable via dropbox, and *animated*. A complex scene on paper can become a cryptic mashup of lines and circles, but Shot Designer shows character and camera moves in real time or in steps. 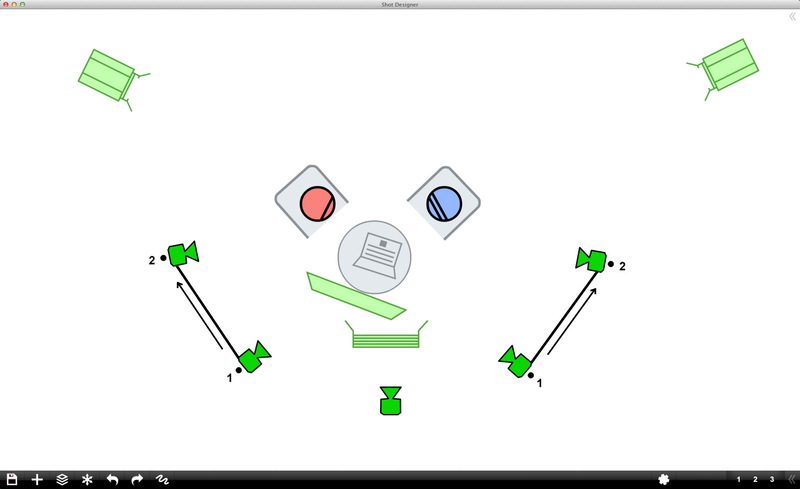 You can set up lighting diagrams too – using common fittings including KinoFlos, 1x1s, large and small fresnels, and populate scenes with scenery, props, cranes, dollies, mic booms and so on – all in a basic visual language familiar to the industry and just the sort of heart-warming brief that crews like to see before they arrive on set. My quick example (taking less time that it would to describe over a phone) is a simple 2-up talking head discussion. The locked off wide is matched with two cameras which can either get a single closeup on each, or if shifted, a nice Over Shoulder shot. A couple of 800W fresnels provide key and back-light but need distance and throw to make this work (if too close to the talent, the ratio of backlight to key will be too extreme) so the DoP I send this to may recommend HMI spots – which will mean the 4 lamp Kino in front will need daylight bulbs. So, we’ll probably set up width-wise in the as yet un-recced room – but you get the idea: we have a plan. Operationally, Shot Designer is quick to manipulate and is ruthlessly designed for tablet use but even sausage fingers can bash together a lighting design on an iPhone. There’s a highlighter mode so you can temporarily scribble over your diagram whilst explaining it. The software is smart too – you can link cameras so that you don’t ‘cross the line’, Cameras can ‘follow’ targets… It builds a shot list from your moves so you can check your coverage before you wrap and move to the next scene. Interestingly, there’s a ‘Director’s Viewfinder’ that’s really handy: Shot Designer knows the camera in your device (and if it doesn’t you can work it out), so you can use that to pinch and zoom to get your shot size and read off the focal length for anything from a AF101 or 5D Mk 3 to an Arri Alexa – other formats (e.g. EX1R or Black Magic Cinema Camera) will be added to the list over time. Again, this is an ideal recce tool, knowing in advance about lens choice and even camera choice). This really is not a storyboard application – Per Holmes goes to great lengths to stress that storyboarding can push you down a prescribed route in shooting and can be cumbersome when things change, whereas the ‘block and stage’ method of using multiple takes or multiple cameras gives you far more to work with in the ‘third writing stage’ of editing. You can incorporate your storyboard frames, or any images, even ones taken on your device, and associate them with cameras. Again, that’s handy from a recce point of view right up to a reference of previous shots to match a house style, communicating the oft-tricky negative space idea, keeping continuity and so on. However, future iterations of Shot Designer are planned to include a 3D view – not in the ‘Pre-viz’ style of something like iClone or FrameForge but a clear and flexible tool for use whilst in production. There is a free ‘single scene’ version, and a $20 license for unlimited scenes over all platforms – but check their notes due to store policy: buyers should purchase the mobile version to get a cross-over license to the desktop app, as rules say if you buy the desktop app first you’ll still be forced to buy the mobile version. Shot Designer may appear to be for Narrative filmmaking, but the block and stage method helps set up for multicam, and a minute spent on blocking and staging any scene from from wedding to corporate to indie production is time well spent. The ability to move from Mac or PC app to iPad or Android phone via dropbox to share diagrams and add notes is a huge step forward from the paper napkin or ‘knocked up in PowerPoint’ approach. It will even be a great ‘shot notebook’ to communicate what the director wants to achieve. Just for its sharability and speed at knocking up lighting and setup diagrams, Shot Designer is well worth a look, even at $20 for the full featured version. If you combine it with the Blocking and Staging aspect and its planning capabilities, it’s a great tool for the Director, DoP and even (especially) a Videographer on a recce. Two years ago, I had an internal hard disk drive fail the day before going on a job abroad – thankfully it didn’t happen on the job, as I needed to offload SxS cards whilst on site. The only solution that would work for me was to just go out and purchase a whole new MacBook Pro, and ‘restore’ my old identity onto it. That’s when having backups really saves the day – but I learned the value of REGULAR backups after that. It can tell you that your hard disk is working. Yay. It can tell you if your hard disk is broken. Boo. But some would say that diagnosing anything in between is a bit of a crap shoot. SMART Utility has a go, by looking at a variety of reports on read errors and some technical stuff I don’t understand. It also knows how old your hard disk is, and quite frankly I think this is its most reliable feature – a bit like a weatherman who reports rain when his corns hurt. whilst I tried to purchase some more disks at a local emporium. But that’s another blog. Back home, I attached the Time Machine drive to the Mac, booted up off the original DVD-ROM and rather than install the OS, I opted to use Time Machine to restore my hard disk. This reformats the entire drive so you start from scratch, so don’t bother doing anything to it beforehand. The process is simple: select the Time Machine backup you want to restore from (latest, or any other stages in the past), select which drive to restore to, and hit the button. The time it thought it would take varied from three to six hours, but it took two and a bit. Everything worked straight away, except for Mail where I mistook its desire to reimport – it sounds contradictory, but let Mail do this. If it goes wrong, just use Time Machine to restore the Mail folders in the Library and try again. A couple of FCP filters needed reinstallation (probably because they were damaged). And now I’m left with my old hard drive. It still works. Maybe not trustworthy as a day to day drive, and in its post upgrade state, pretty useless. Shut down your MacBook Pro. Restart with the option key down. Your old hard disk and your new hard disk appear to boot from. Select your USB drive, and lo – your Mac boots from it. Everything functions as it did. That excites anyone who has faced the nightmare scenario of working on-site and your main machine develops a fault – I’ve had PCs get killer viruses, hard disks fail, machines get dropped, stolen, soaked – and the time involved to ressurect a sick machine, reinstall OS and software, iron out the problems make for stomach churning stuff. So should you need to bring in a backup machine in a hurry, your little magic drive enables you to imprint it with your apps, documents and plug-ins and work as before – if a little more slowly – until you can make more permanent arrangements. And I hope I NEVER have to use it. PS: Update – the MacBook Pro feels a bit snappier and alert – like it’s had the second cup of coffee in the morning. A combination of 7200RPM and having 15-20% free space has improved the general responsiveness of launching apps, working with big files, system stuff and so on. However, I still work with external 7200RPM drives for all footage, assets, project files and renders. In the future, I will order MacBook Pros with 7200RPM internal disks. And I’ll clone the drives to bootable externals too. I shoot with Sony’s PMW-EX1 (and now an EX1R). Brilliant cameras, they shoot onto solid state ‘memory cards’ rather than tape. They shoot ‘files’ rather than ‘footage’, and the benefit is that it’s quicker to copy an hour’s worth of video from a card than it is from a tape. A half, a third, even a quarter of the time. With expensive hardware, even a fifth of the time. If you have lots of rushes or short deadlines, it’s great. Okay, now lets say you’re a producer and you hire a cameraman to shoot something for you. Usually, you just take away the tapes and hand them to your editor (or even ingest it yourself). That’s easy. So what if you hire a cameraman with one of these new-fangled EX1s then? The polite answer is that the cameraman goes behind a metaphorical curtain and does a little bit of alchemy, then hands you a hard drive with all your rushes, ready to edit. Except it’s not actually like that. There’s physical formats and there’s metaphysical formats for video. You can get a tape that’s a physical format – a DVCAM cassette isn’t going to be a snug fit in a BetaCam SP player. We understand that. So there’s P2, SxS, SDHC, XDCAM disks, and so on – you need the right shaped hole to receive its bounty. Then into the metaphysical – there will be video clips that are basically computer files, and each file will have its container format – QuickTime, AVI, MXF and so on. Then inside each is the ‘flavour’ of video – is it H.264, is it MPEG2, is it DVCPro-HD, is it DV? This is way beyond the point at which most sane, intelligent humans cease to care about such minutiae and simply nod in empathy whilst trying to sneak a view at their watch. Because all you want to know is ‘it just works’. Huh? Wait, what software? I have to install something? How do I use the software? What am I doing or achieving here? Will my computer run it? Can I do any damage to anything? Is there something I might do wrong that will cause unknown hell to break loose later on when you’re no longer within reach? Can I have a tape please? I like tapes. But I’m in the edit suite tomorrow, so just send them round tonight when you’re back home. So the cameraman with his shiny new edit-ready footage goes home and either transcodes everything to DV (one long process) then plops them onto DVCAM (assuming deck or device, not wishing to even comment on TimeCode here). Or maybe does the nice thing and uses XDCAM Transfer to make beautifully named and equisitely perfect QuickTime movies and copies them onto a MacOS formatted disk. The producer uses a Mac. The DVCAM Producer gets the tapes the next day as the cameraman was up all night nursing the four hours of footage through, trying to get TimeCode working. The tapes go in, the editor asks what it was shot on, and the producer says it was supposed to be one of those edit ready things, but tape’s so much easier. The cameraman, having watched the dawn, retires to bed. So, this imaginary episode of Stressed Eric was brought to you by the Sony EX1-R. The EX1-R shoots Standard Definition video to SxS, SDHC (in appropriate adaptor) and Memory Stick Pro Duo in the MEAD (MEmorystick ADaptor) as AVI files. you can attach PC disks to your Mac and write to them. Not just those piddly little naff files handled by ‘FAT32’, no, you can use NTFS which is the PC equivalent of Mac OS disks. – Client can read them on Mac or PC. Now… THAT is a workflow. I still think the best SD quality comes from 720p, and that I prefer a folder full of exquisitely named QuickTime movies with embedded information like Speaker, Title, Location and Good Take markers, but I have Editor DNA and I am lucky enough to eat from my own dog bowl (associates ‘Drink their own champagne’ apparently). But there you go. To all you Producers out there who want a simple, easy workflow from one of those funny new-fangled cameras with the nice pictures and the cheap price tag, just ask for the EX1-R.